The custom wallpaper imagery inspiration we're focusing on today is spiritual imagery. 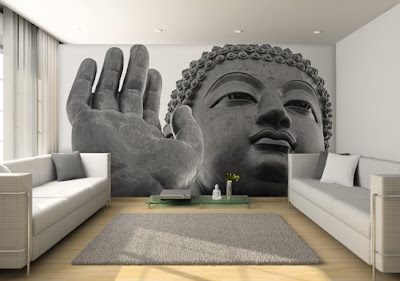 Though you may not want to bring up religion at dinner party, you can certainly feel comfortable displaying a religious custom wall mural that accentuates your decor in your own home. Regardless if you're outspoken or more meek about your spiritual life, a wallpaper wall mural will speak volumes about your faith. For instance, in the inspiration room we're featuring an image of Buddha. This specific Buddha image is a photograph of a statue in Thailand from an ancient temple. This is the type of image that you may have captured on a trip overseas. We recently met a modern day pilgrim who made the pilgrimage to Santiago de Compostela, a trek by foot beginning in France and concluding in Spain. That says devotion in any faith, and the imagery he captured was perfect for a wall mural or giclee to commemorate the experience. Whichever faith you belong to, a custom wallpaper installation will surely be an inspiring addition to your home. Or, if this type of mural would be a good fit for your house of worship as opposed to your home, know that we've previously printed a number of custom wall murals for Churches and Synagogues across the country and around the world. The balancing act is creating a mural that is at once beautiful and engaging, while not being either heavy handed nor trivializing the content. Contact us to learn more.